Want an Explanation for Secular Stagnation? Try Demographics. The Federal Reserve can lower interest rates to zero, or even–as the European Central Bank has done–into negative territory. But it can’t make lenders lend or would-be borrowers borrow if they don’t want to. And it certainly can’t make a shopper open their wallet and spend if they’re more inclined to save. Economist John Maynard Keynes is often credited for comparing these limits of monetary policy to “pushing on a string,” but the term actually predates him. Congressman T. Alan Goldsborough used the term during the congressional hearings on the Banking Act of 1935. At any rate, it is a good metaphor. And it’s the problem facing the United States, Europe, Japan and even China. The Fed’s quantitative easing (“QE”) programs have run their course–at least for now–and America is slowly moving towards more “normal” monetary policy. Whether or not QE worked in the U.S. is a matter of debate. 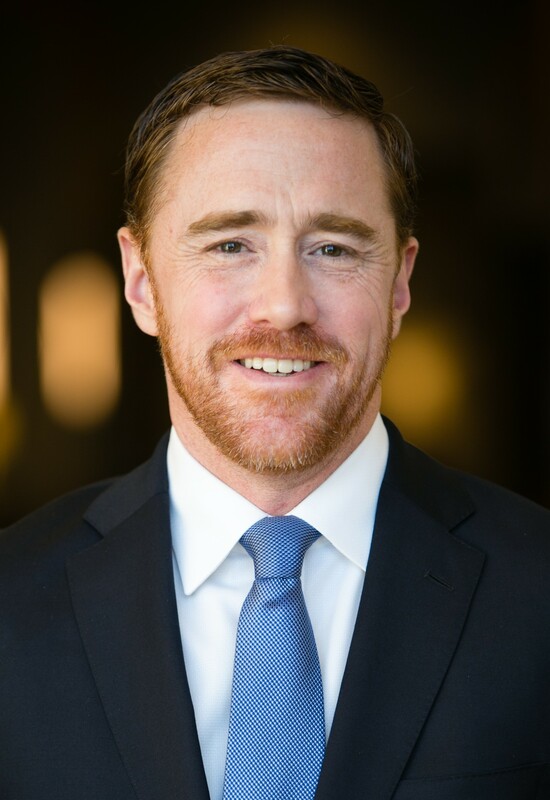 My view is that is was wildly successful is stoking a bubble in the stock market and in giving homeowners a refinancing windfall, but not much else. Credit growth is still very weak, and consumers are not as eager as to spend as they were before the 2008 meltdown. But while the U.S. has pulled back from its QE excesses, Japan and Europe are just getting started, and China is getting more creative as well. Thus far, none of this has amounted to much more than pushing on a string. The Economist recently suggested that demographics were the cause of this secular stagnation. I agree. Years of working with Harry Dent taught me that a person’s age is the single biggest contributing factor in their spending decisions. Advertizers have understood this since the dawn of mass consumerism. You’re a lot more likely to see commercials for Viagra or life insurance during a baseball game than you are during a Twilight movie. But economists tend to ignore the role of demographics, focusing instead on big “macro levers” like interest rates and government spending. Sound familiar? It should. Japan has been living this nightmare scenario for the past two decades. As its population has aged and shrunk, its economy has stagnated. And the aging of America’s baby boomers means that we’re facing a lesser decree of Japan’s experience here. Economists tend to put the most weight on this first factor, though it is the one I find the least important. Labor can be replaced with technology. This has been the case since the Industrial Revolution, but information technology and robotics are making it ever more true with every passing day. Labor shortages simply spur more automation as businesses look to cut costs. This is where modern economics really misses the point. Sure, you can boost output by boosting the labor supply. Put every man, woman and child to work on 18 hour shifts, and you can send production through the roof. But if underlying demand is not sufficient to absorb the new supply, prices fall and eliminate profits. Keynes and Hansen pointing this out when mulling over population size. Harry Dent took it a major step further by considering the age of the population. But the key takeaway here is that an aging an shrinking population will consume less…which means that boosting production will only cause price deflation. Want an explanation for the low bond yields on offer across the globe? A fair bit of it can be explained by baby boomers aggressively saving and hunting for yield. As boomers pile into income-focused investments, they push yields down. Watch Japan to find out. As Japan’s elderly start to spend down the colossal savings they’ve accumulated, it will eventually push up bond yields. Of course, the Bank of Japan is aggressively suppressing yields with the biggest QE program in history. But this has caused the value of the yen to plummet, which in turn has caused the prices of imports to rise. None of us can say with certainty how this will end because it’s never been seen before. But my bet is that Japan’s chronic deflation reverses into outright hyperinflationary collapse. The Financial Times published a good piece this week on the boom in 1980s “classic cars.” Yes, I put “classic cars” in quotation marks because, frankly, everything to come out of that decade is horrendously ugly and best forgotten. The 1980s, often recalled as fashion’s ugliest decade, is back in favour when it comes to sports cars. Collectables such as the Ferrari 308, driven by Tom Selleck in the Magnum PI television crime drama, are rapidly rising in value as a new generation of buyers enters the classic car market to purchase the cult supercars of their youth. A Lotus Esprit car converted into a submarine and taken underwater by James Bond in The Spy Who Loved Me in 1977, was listed on eBay this week for $1m – in the region of the price Tesla chief Elon Musk paid for a similar model last year. What’s driving the boom? Ian Fletcher of IHS Automotive calls it “bedroom wall syndrome.” The boys that used to hang posters of these cars on their bedroom walls are now middle-aged men with the disposable income to buy them. 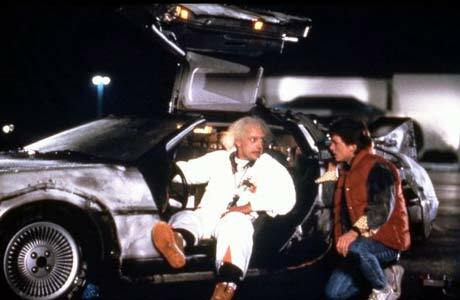 Doc’s time machine would be worth a lot of money today. Men are predictable. Most of us, while we age physically, never really mature much beyond our teenage years. So might buying broken-down old sports cars be a viable investment strategy? Yes, but pay attention to demographic trends. A man who is 50 today was born in 1964, just a couple years past the peak of the post-war baby boom. He would have been sixteen years old–and fantasizing about exotic sports cars as much as exotic women–in 1980. The demand you see today for early 1980s cars are from men born at the very end of the baby boom. But think about what came next. After 1961, U.S. births went into a long decline that didn’t bottom out until the late 1970s. It wasn’t until the late 1980s that Americans really starting having babies at anything close to the levels of the 1950s and 1960s baby boom. It means that we shouldn’t expect a repeat of this next decade with 1990s classic cars. Why? There will be a shortage of middle aged men buying 1990s cars next decade because there was a shortage of teenage boys in the early to mid 1990s to lust after them. If you want to play the long game here, start shopping for hot cars from the mid-to-late 2000s in another 10-15 years. The boys born in the “mini baby boom” that peaked in the early 1990s were car-crazed teenagers circa 2006. They will be 40-something professionals with disposable income to burn by the early 2030s. The Economist ran a piece over the weekend prodding German Chancellor Angela Merkel to “Build Some Bridges and Roads” as a way of jolting Germany’s slowing economy back into growth. My response: Who’s going to be driving on them in another 10 years? Take a look at the following chart, which comes from the United Nation’s Population Division. All estimates are using demographic data as of 2012. Germany is in the midst of a multi-decade baby bust. Its population peaked in the mid 2000s and has been in decline ever since. The average estimates (i.e. 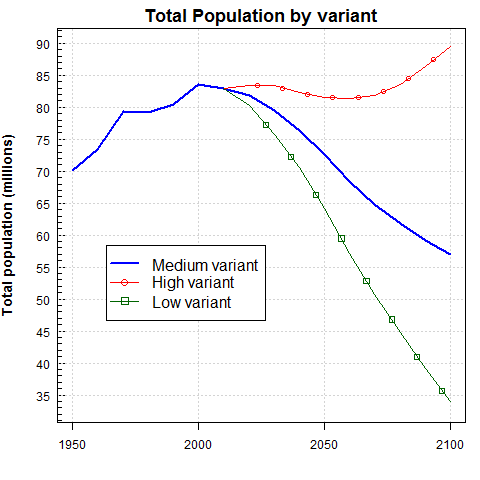 “medium variant”) shows Germany losing nearly 10 million people by 2050, or roughly 12% of the population. Another 10.4 million Germans–or nearly 14% of the then-living population–will be aged 80 or over. So roughly a quarter of Germany’s current population will be either dead or too old to do a lot of driving in another 35 years. So I repeat the question: Who’s going to be driving on all of the roads and bridges The Economist is prodding Germany to build? Germany has consistently resisted looser monetary policy by the European Central Bank and calls from the rest of Europe for Germany to spend more as a way of keeping the Eurozone economy afloat. On the first count, I’d say Germany is dead wrong. The German obsession with inflation looks more ridiculous every day as the Eurozone inches closer and closer to outright deflation. But on the resistance to run government budget deficit, the Germans are taking the only course of action that makes sense. Running up debts today to build infrastructure that no one will be around to use makes no sense, particularly when you figure that there will also be no one around to pay it back. @CharlesSizemore Funny last night and this morning going through my 4k baseball cards from the 50s and 60s. They have been an attic forever. @scottd All morbid joking aside, I wouldn't expect Gen X of Millennial collectors to pay as much for those cards. @scottd It's very much a "Baby Boomer nostalgia" trade. @scottd I noticed a similar dynamic with classic cars. The "it" classic car is determined by what generation is having its midlife crisis. @scottd Guys in my cohort will be buying mid-1990s Mustangs and Cameros in another 10-15 years, reliving our youths. @CharlesSizemore Yes I think perceptive people with LT outlook could do well buying 10 years ahead of time. Not with cards but cars. Here’s a little something to think about following Mother’s Day. 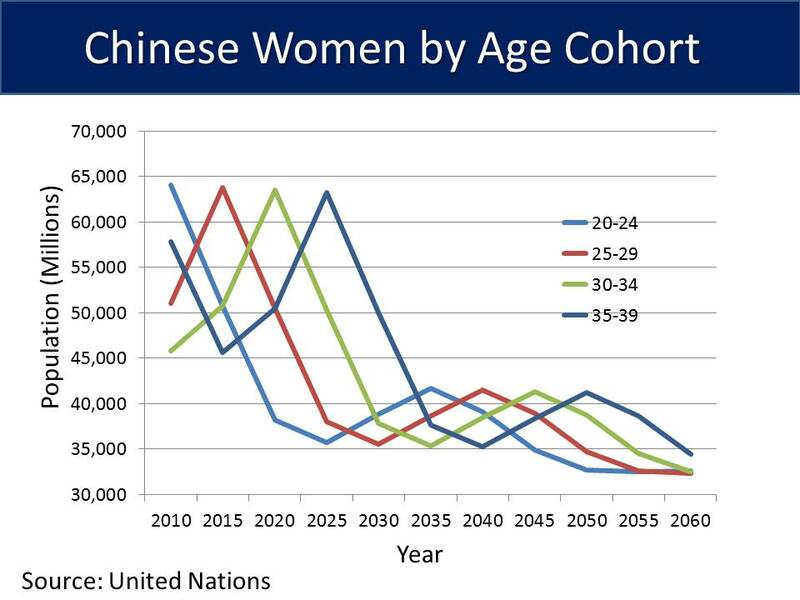 I trot this chart out every few months to drive home an important point: Over the long term, China is destined to undergo a Japan-style demographic malaise. It is unavoidable, and there is no policies the Chinese government can implement at this point to stop it. I should be clear; in the immediate term, I am a major China bull and I am long China via the iShares MSCI China Large Cap ETF (FXI) and the DB X-Trackers Harvest China ETF (ASHR). But China’s future looks bleak. I would go so far as to say China has no future. Take a look a the chart. China’s population of women of prime childbearing age (25-29) goes into steep decline starting next year. Children are the future. You need them to pay the taxes and man the factories of tomorrow. More critically, in the age of modern consumer capitalism, you need them swiping the credit cards and buying the homes of tomorrow. This is particularly relevant for China given its government’s stated goal of reorienting its economy away from exports and towards domestic consumption. Of course, children require mothers to bring them into the world. And they are about to be in short supply. Average age of marriage and first childbirth are rising worldwide, and as a general rule the more developed a country becomes (and the more educated its women become) the higher the age of marriage and motherhood. So, let’s assume that China’s women are postponing motherhood under their early 30s. Even then, China has a major problem. Its population of women aged 30-34 goes into steep decline starting in 2020. Conception is still possible into the late 30s and 40s, of course. But it gets more difficult and, realistically, it limits family size. 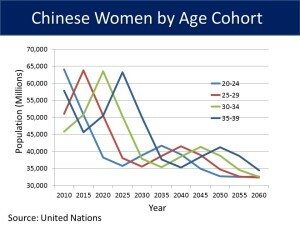 China is facing a demographic death spiral. China is a buy today. But in another decade, it will likely be the short opportunity of a lifetime as China sinks into a deflationary abyss. Charles Lewis Sizemore, CFA, is the editor of Macro Trend Investor and chief investment officer of the investment firm Sizemore Capital Management. Join Macro Trend Investor today and start profiting from the powerful megatrends that are cresting across the global economy—and get ahead of the next macro trend to build your wealth for years to come. Just $1.00 grants you your all-access pass!